KLES Institute of Nursing sciences have emerged as a premier organization committed towards providing quality education.It has passed many mile stones logged in numerous achievements, created an image for imparting superior education, carved out a niche for itself in Nursing Profession as well as in academic arena. As an educational institution, our mission is to prepare and develop the right human capital with optimum blend of personal & professional competencies. at various superspeciality hospitals. The students are encouraged & are sponsored to participate in a multitude of seminars, conferences & sports organized at state & National level competitions. Dean, Faculty of Nursing KLE Academy Of Higher Education and Research, Belagavi. Dissertation awarded best research award,Stood first in M. Phil(N) Course, at MAHE Manipal University. 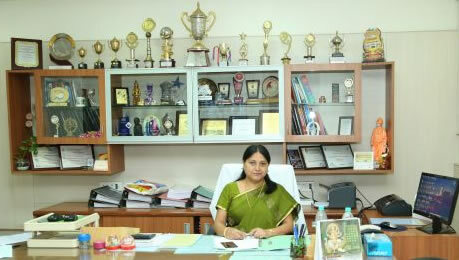 Founder Principal, K.L.E.S’s Institute of Nursing Sciences, Hubli. Part Time Project Coordinator and Academic Counselor for Indira Gandhi National Open University for B.Sc. Nursing Students. Felicitated for Outstanding Service for Sick Neonates, Children, Medical and Nursing Profession in 3rd Karnataka State Annual Conference of Neonatal Nursing held on 5th and 6th of September 2009 at Bapuji Auditorium, Davangere. State SOMI NSSK Coordinator to train all SOMI members in Karnataka. NSSK Trainer under IAP-SOMI partnership for the neonatal resuscitation –FGM programme. Master Trainer for Helping Babies Breathe (HBB) project. Visited to University of East Angela Norwich, UK as a part of UKERI Project from 13.10.2014 to 24.10.2014 and Principal investigator for the project titled INSTITUTIONAL CAPACITY BULLING (ICB) under UKIERI grant from British Council. Dissertation awarded Best Research Award, Stood first in M. Phil (N) Course, at MAHE Manipal University. Founder Principal,L.E.S’s Institute of Nursing Sciences, Hubli. State SOMI NSSK Coordinator to train all SOMI members in Karnataka. Organised three workshops till date. Member, governing body for Health Sciences Institutes, KLE Society, Belgaum. Principal for the Diploma in General nursing and Midwifery course, under KSDNEB, at KLE Society’s Institute of Nursing Sciences, Belgaum. Principal for the ANM course running under DME and Ministry of Health and Family Welfare under KLE Society’s Institute of Nursing Sciences, Belgaum. Indian Nursing Council (INC) Adhoc Inspector for Colleges of Nursing. Inspection Review Committee member of Karnataka State Nursing Education Board, Bangalore. Examiner for Under Graduate and postgraduate examination under various Universities of Health Sciences. Research Guide for Post Graduate students. Member Post Graduate Board of Studies, Nursing, Rajiv Gandhi University of Health Sciences Bangalore. Former Member of BOS, Goa University. Member of various committees in KLE Academy Of Higher Education and Research, Belgaum. Member of editorial board in International Journal of Nursing Education.